Elihu Vedder (1836–1923), Minerva of Peace (1897), mosaic, dimensions not known, central arched panel leading to the Visitor's Gallery, Library of Congress Thomas Jefferson Building, Washington, DC. Photographed in 2007 by Carol M. Highsmith (1946–), who explicitly placed the photograph in the public domain, via Wikimedia Commons. Elihu Vedder (1836–1923) was a symbolist painter who trained in New York, and with François-Édouard Picot in Paris before going to Italy, where he was influenced by the Macchiaioli, particularly Giovanni Costa. He returned to the USA in 1860, where he undertook illustration work. After the Civil War, he went to live in Italy, and visited the UK and the USA. He was commissioned by Tiffany to design products for them, and was also commissioned to provide murals for the Library of Congress. 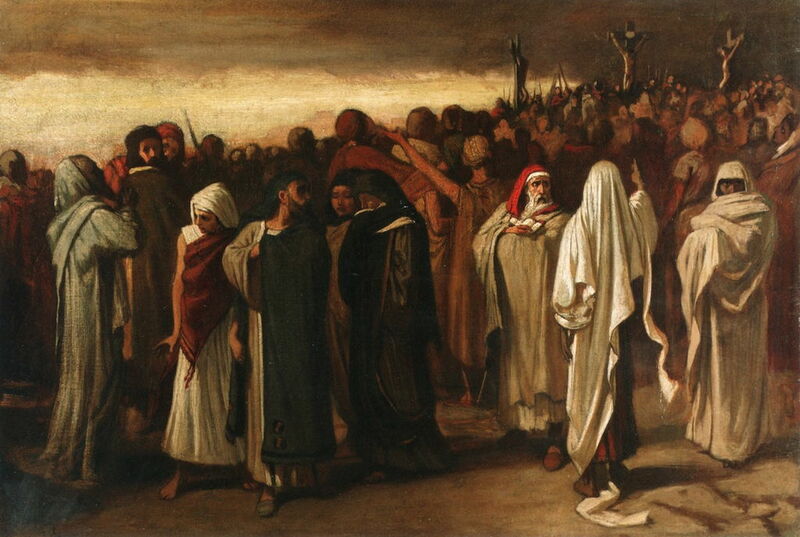 Elihu Vedder (1836–1923), Return from Calvary (c 1867), oil on board, 34.9 x 50.4 cm, Private collection. The Athenaeum. Return from Calvary (c 1867) shows an unusual view of Christ’s Crucifixion, with the crosses in the background behind a large crowd presumably dispersing back into Jerusalem. Although it is tempting to presume that the figures in the foreground are the Marys and Joseph of Arimathea, as they were present at the deposition of Christ’s body from the cross, and its removal for burial, that could not be the case. The Roc’s Egg (1868) shows a scene from the legend of Sinbad the sailor, a story-cycle probably of Middle Eastern origin. These tales were a late addition to the compilation known widely as the Thousand and One Nights, but seemed to exist independently before being incorporated there. In the second voyage of Sinbad, he is accidentally abandoned on an island on which there are roc eggs. Rocs are legendary enormous birds which appear in a number of sources. Here the sailors remove the contents of one of the roc’s giant eggs, which they cook on an open fire. Later in that adventure Sinbad uses a roc to obtain diamonds, before returning home to Baghdad. 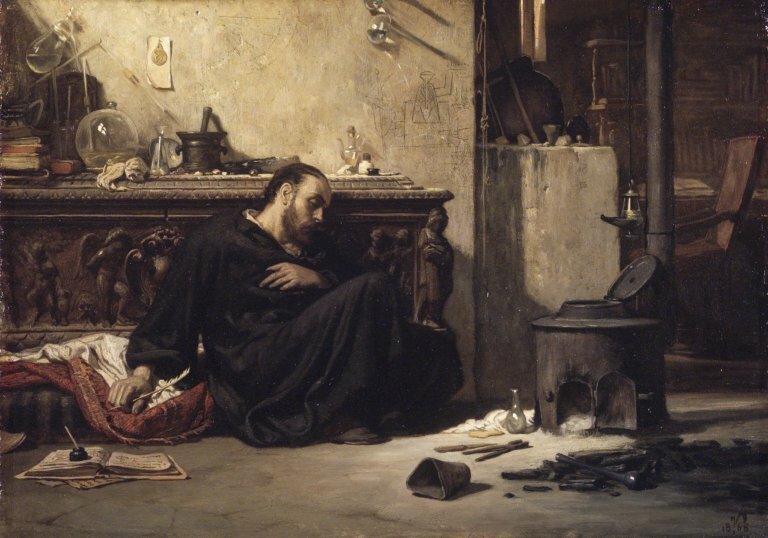 Elihu Vedder (1836–1923), The Dead Alchemist (c 1868), oil on panel, 36.6 × 51 cm, Brooklyn Museum, New York, NY. Photo courtesy of Brooklyn Museum, via Wikimedia Commons. The Dead Alchemist (c 1868) shows a lone figure, slumped and apparently dead against a carved chest. Scattered around him is the equipment which might have been used by an alchemist. During the Age of Enlightenment, alchemy was progressively unmasked as bogus, and at best misguided. Although its replacement by scientific chemistry was a slow process, by the late nineteenth century alchemy was scorned and ridiculed. Vedder may have used this image to illustrate poetry. 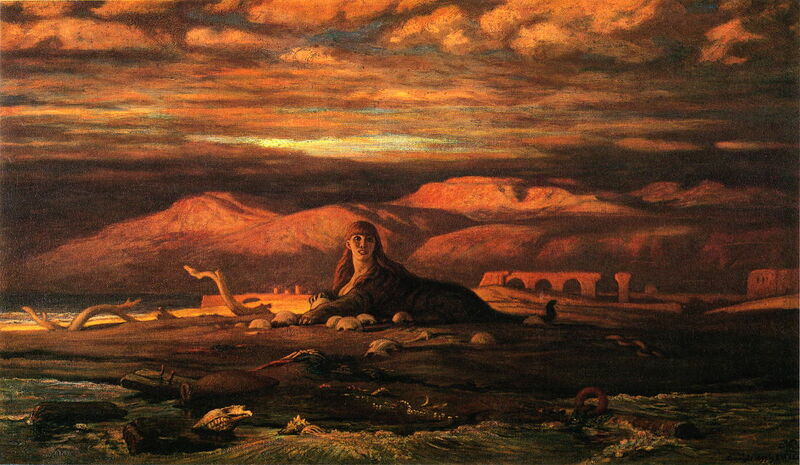 Elihu Vedder (1836–1923), Memory (1870), oil on panel, 51.6 x 37.5 cm, Los Angeles County Museum of Art, Los Angeles, CA. The Athenaeum. This remarkable painting is one of the earliest symbolist images made by an American artist. Its origins are probably in sketches which Vedder made in 1866 and 1867, according to Regina Soria. 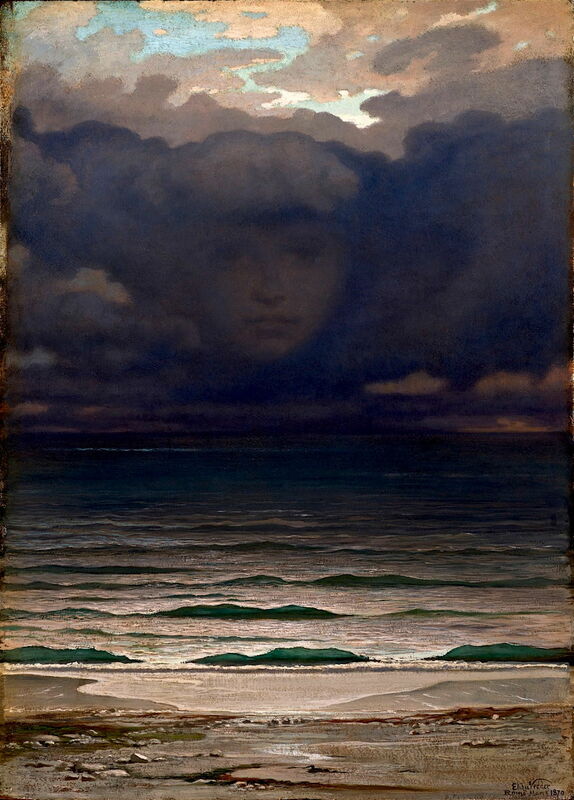 The earlier of those was a response to Tennyson’s poem Break, Break, Break (1842), in which he ponders the memory of loved ones when contemplating the sea – which is exactly what Vedder shows here. The crisp realism of the waves and beach contrast with the soft vagueness of the face in the clouds. In the classical world, sibyls were prophetesses who were able to see into the future, and when consulted could provide guidance and predictions. Ten or a dozen different sibyls are known from records, of which the most important was that at Cumae, shown in this painting. The Cumaean (Cumean) sibyl played a major role in the foundation and success of Rome and its empire. The first key role that she had was of selling the Sibylline books to the last king of Rome. The second key role was to prophesy to Aeneas (hero of Virgil’s Aeneid) about his future in Italy, which drove him to travel there. Vedder appears to have focussed on the first role, in that he shows the sibyl striding out, clutching several scrolls under her right arm, presumably the Sibylline books which were to guide the future of Rome. 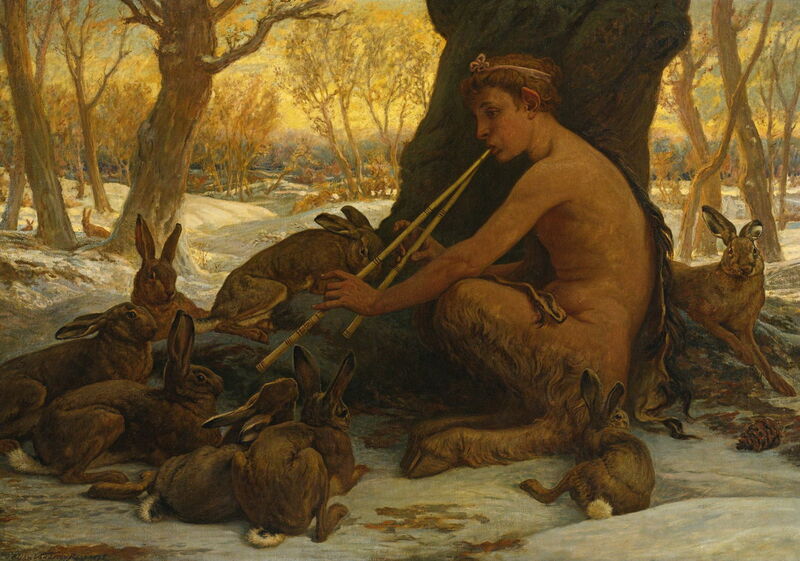 In Greek mythology, Marsyas was a satyr (top half human, bottom half goat) who one day found a double-piped reed instrument known as a double flute (although it is not a flute) or aulos. This had been tossed aside by Athena, who had invented it, when the other gods made fun of the way that she puffed her cheeks out when playing it. Marsyas became an expert aulos player. Unfortunately, he later lost a musical contest with Apollo, as judged by the Muses, and was flayed alive – a grisly scene which was once quite a popular subject for paintings. Late in 1877, Carrie Vedder, the artist’s wife, recorded in a letter that her husband had been thinking about Marsyas, and considered that, before the contest with Apollo, Marsyas must have proved his skill with the aulos. He therefore came up with the idea that this must have at least been charming hares with the instrument. He started this painting early in 1878, setting it in the New England winter. This and The Cumean Sibyl were shipped to Paris for show at the Exposition Universelle later that year, but Vedder was disappointed that they did not do well there. The sphinx was a mythical creature with the head of a human, the haunches of a lion, and sometimes a bird’s wings. Two varieties were known: the Greek sphinx, based on a woman and typically shown with human breasts, and the Egyptian, based on a man’s upper body. The only Greek sphinx known was that which guarded the entrance to the city of Thebes, which I have already discussed and shown together with Oedipus, who guessed its riddle. Vedder shows a distinctly Greek sphinx in a coastal desert which could readily be close to the city of Thebes, in the rich red light of sunset. Around the sphinx are the skulls and other remains of those who did not solve its riddle correctly. 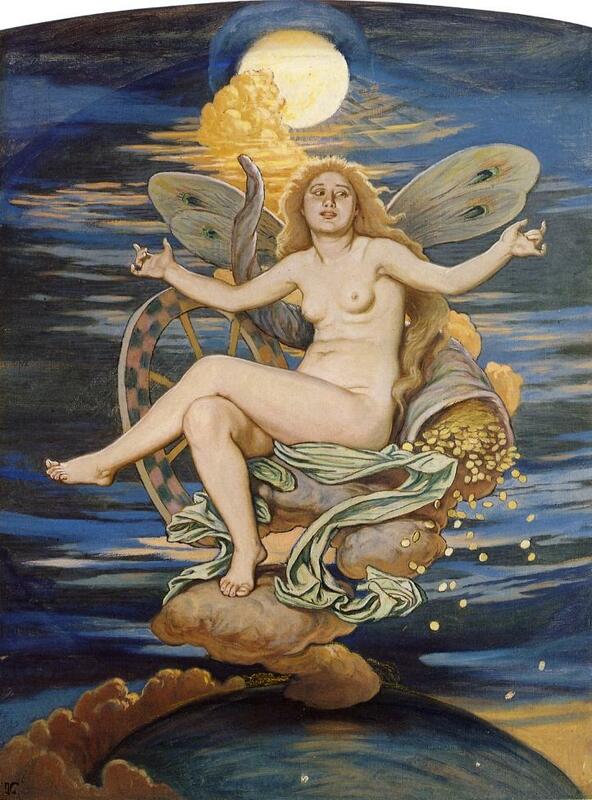 In Greek mythology, the Pleiades were originally the seven daughters of the titan Atlas and the sea-nymph Pleione. When Atlas was made to carry the heavens on his shoulders, Orion started to pursue the Pleiades, so Zeus transformed them into doves, then into stars. Their name is given to a star cluster, which it appears that the constellation of Orion chases across the night sky. Vedder’s painting was made in association with his first illustration for the Rubaiyat of Omar Khayyam, representing Khayyam’s horoscope. Interestingly it shows each connected with their corresponding star by a thread, here perhaps representing the process by which they were turned into stars, or catasterism. 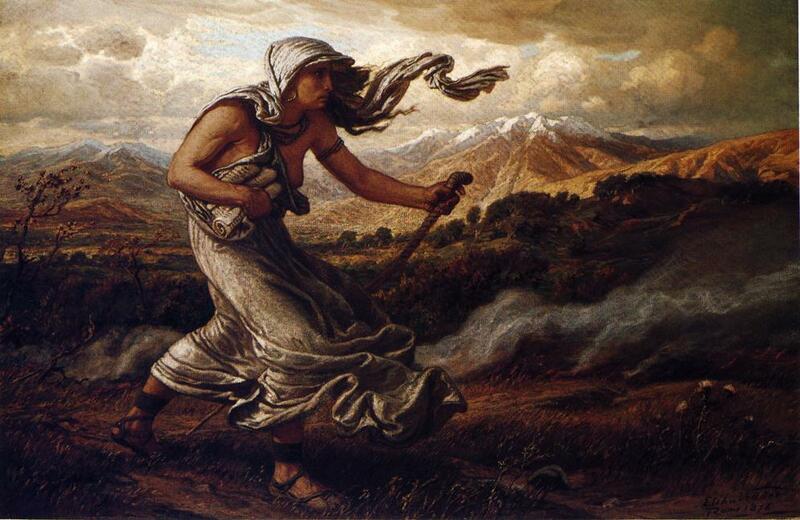 Elihu Vedder (1836–1923), The Etruscan Sorceress (1886), oil on canvas, 34 x 17.1 cm, Private collection. The Athenaeum. Although identified as being Etruscan, a civilisation which preceded Rome in central and northern Italy, this painting has all the symbolic associations of Medea, from the legend of Jason and the Golden Fleece. She is holding a vial which Jason used to capture the fleece, and at her feet is an open fire which is associated with preparation of the potion for the vial. Classical legends were rich in other sorceresses, but that is the most likely association. 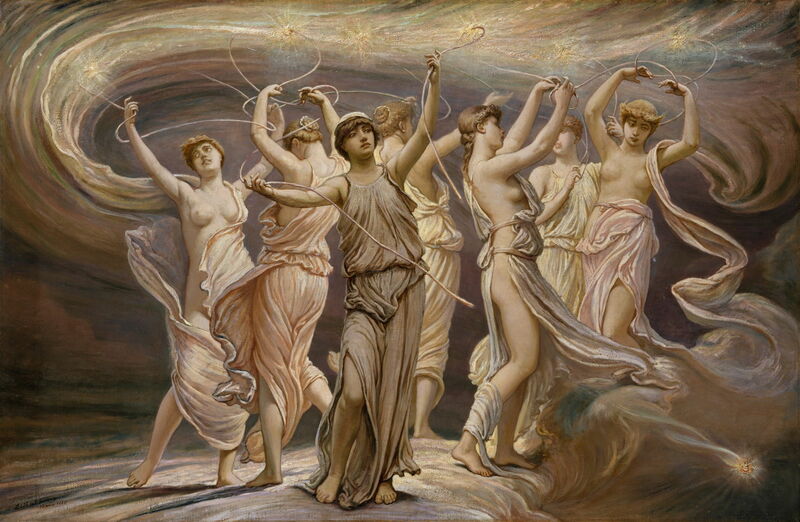 Elihu Vedder (1836–1923), The Fates Gathering in the Stars (1887), oil on canvas, 113 cm x 82.6 cm, The Art Institute of Chicago, Chicago, IL. Wikimedia Commons. 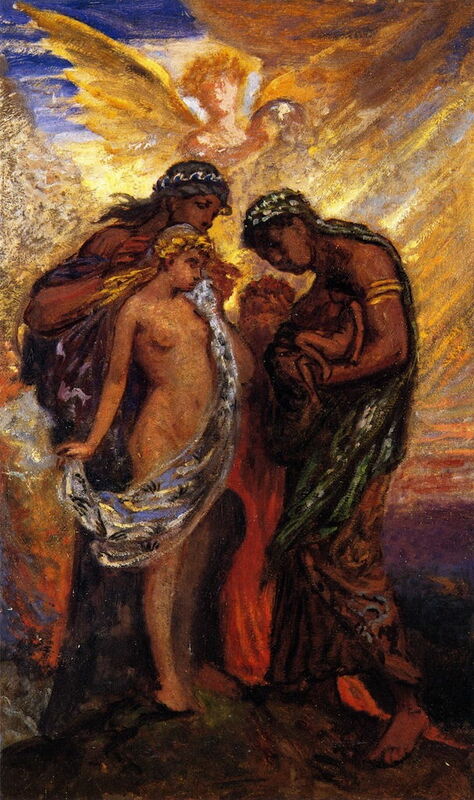 This painting is Vedder’s only known depiction of the Fates, although in an atypical setting. Derived from another of the illustrations which he made for the Rubaiyat of Omar Khayyam, it shows the three Fates bringing in the fabric of the heavens, which holds the stars. To enable them to do this work, they have placed the tools of their trade – distaff, spindle, and shears – in the fabric of the foreground. 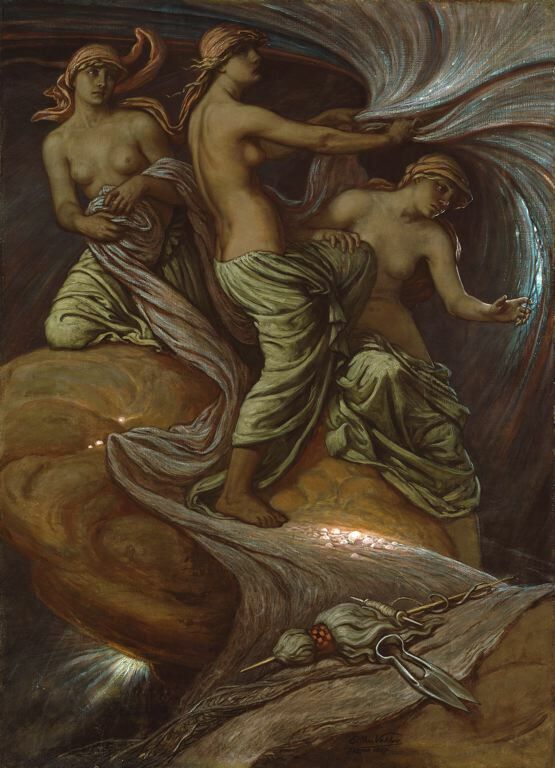 This must also be one of very few paintings of the Fates in which they are not handling the thread of fate. In the Roman religion, Fortuna (Greek equivalent Tyche) was the goddess of fortune and luck, both good and bad. More usually depicted as being veiled and/or blind, to indicate the chance involved, she was the embodiment of capriciousness. Vedder shows her as a carefree, happy-go-lucky woman, with the wings of a dragonfly (or possibly mayfly), sat next to a sack of gold coins. Elihu Vedder (1836–1923), The Cup of Death (1885, 1911), oil on canvas, 113.9 x 57 cm, Smithsonian American Art Museum, Washington, DC. The Athenaeum. Vedder first painted this in 1885, but reworked it extensively in 1911. It shows an angel holding a cup to the face of a young woman who is swooning, and being supported by the angel. The light is eerie, with half the moon visible through a break in the cloud. It might possibly be a representation of the common subject of early death, using a more subtle approach than the usual Angel of Death or Grim Reaper. Elihu Vedder (1836–1923), Elements Gazing on the First Man (c 1913), oil on paper, 40.6 x 25.4 cm, Brigham Young University Museum of Art, Provo, UT. The Athenaeum. This delightfully loose and painterly oil sketch was probably associated with a poem which he quoted in his autobiography, titled The Advent of Man. That described how the elements delighted in man until his destructive nature was manifest. Here man is shown in almost embryonic form, cradled in the arms of the figure on the right. This does not appear to have been worked up into a more finished painting, but was particularly poignant given the outbreak of the First World War in the following year. Vedder’s most prominent and lasting achievements are the murals in the Lobby to the Main Reading Room of the Library of Congress in Washington, DC. 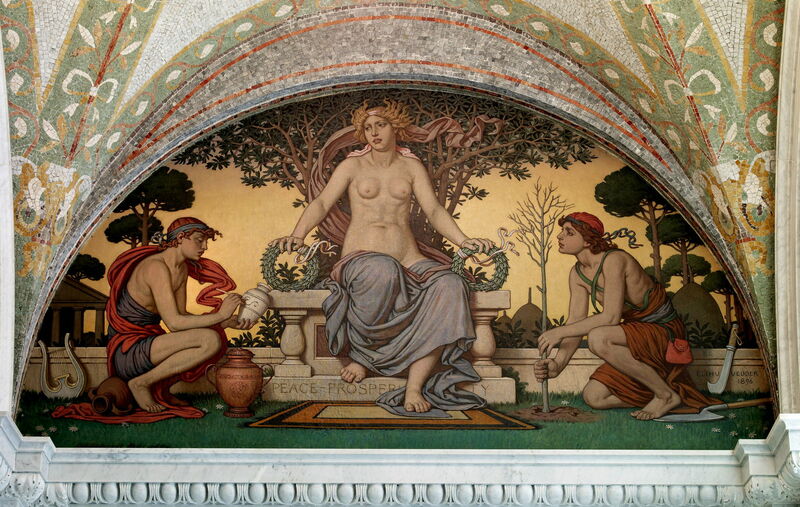 Elihu Vedder (1836–1923), Peace and Prosperity (1896), mural, dimensions not known, Lobby to Main Reading Room, Library of Congress Thomas Jefferson Building, Washington, DC. Photographed 2007 by Carol Highsmith (1946–), who explicitly placed the photograph in the public domain, via Wikimedia Commons. In Peace and Prosperity (1896), the symbolic figure rests her hands on laurel wreaths, indicating victory. At the left, a youth is painting decorations onto urns, and behind him is a lyre. On the right, another youth is planting a tree for the future, with a billhook and spade. 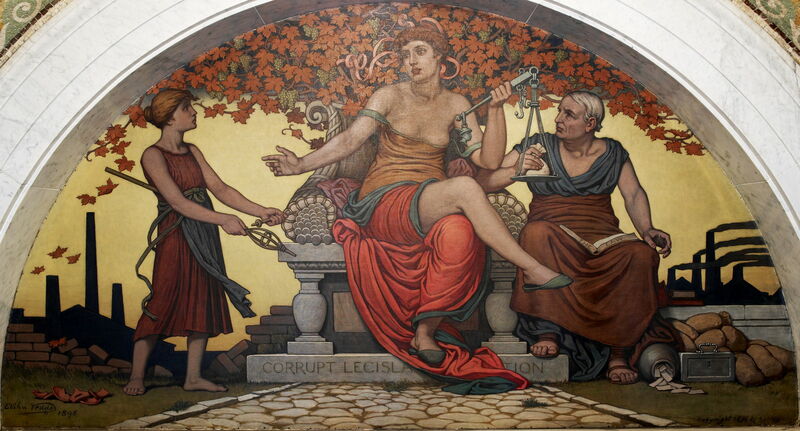 Elihu Vedder (1836–1923), Corrupt Legislation (1896), mural, dimensions not known, Lobby to Main Reading Room, Library of Congress Thomas Jefferson Building, Washington, DC. Photographed 2007 by Carol Highsmith (1946–), who explicitly placed the photograph in the public domain, via Wikimedia Commons. Corrupt Legislation (1896) is a more elaborate composition which looks at the consequences of poor government. The central figure is more floozy than goddess, holding a set of scales in her left hand. At the right of the painting, and on that left hand, is a lawyer, with an open book labelled The Law. At his feet, banknotes fall out of an urn, there are small sacks of grain, and a small portable ‘safe’. At the left, apparently pleading with the central figure, is a young girl holding any empty distaff and bobbin for spinning. Behind her are shards from a broken pot, and a broken-down wall. 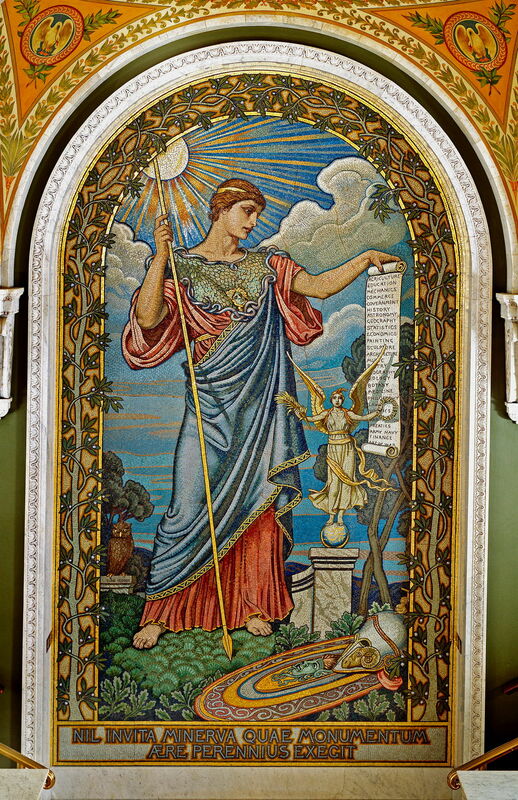 Vedder also made a beautiful mosaic which is in the central arched panel leading to the Visitor’s Gallery of the Library of Congress: Minerva of Peace (1897). Minerva, derived from an Etruscan goddess, was the Roman goddess of wisdom, the guardian of civilisation, and sponsor of arts, trade, and strategy. Shown here as the Minerva of peace, Vedder stressed that this was attained by warfare, and shows a miniature statue of Nike, the Greek winged goddess of victory, known to the Romans as Victoria. Nike holds the palm frond of peace, and the laurel of victory. Minerva’s helmet and shield rest on the ground, but she remains ever-vigilant in holding a spear in her right hand. Her left hand holds a scroll, which she gazes at, listing the fields of learning, from Agriculture to Zoology and Finance. These show Minerva’s association with wisdom and knowledge. To the left of Minerva’s right knee is an owl, symbolising wisdom. The inscription below, Nil invita Minerva, quae monumentum aere perennius exegit, means Not unwilling, Minerva raises a monument more lasting than bronze, and is quoted from Horace’s Ars Poetica. Vedder’s richly symbolic paintings contain references to a wide range of different narratives. As so often happens, some have become detached from their original stories, which makes them puzzles now. This is particularly likely when paintings refer to excerpts of verse which may have been shown with them when they were first exhibited, but which have now become lost and forgotten. Paintings in galleries open to the public are normally provided with helpful information about them which aids their reading; those in private collections may still be accessible via online images, but lack any such information unless it has been provided when they were last sold. Posted in General, Painting and tagged Macchiaioli, narrative, painting, symbolism, Vedder. Bookmark the permalink.